After I introduced 16 To Do Programs for free, I got several comments which lead me to 4 more To Do Programs. 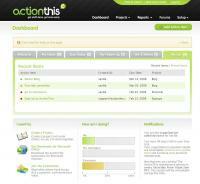 ProjectOffice.net, ActionThis, Deskaway and Simprove Workity and as a bonus antz@work which I just add to the list. A very fully loaded program which is much more than a To Do Program. It’s very good for team work and has a lot functionality where other programs cannot compete with. 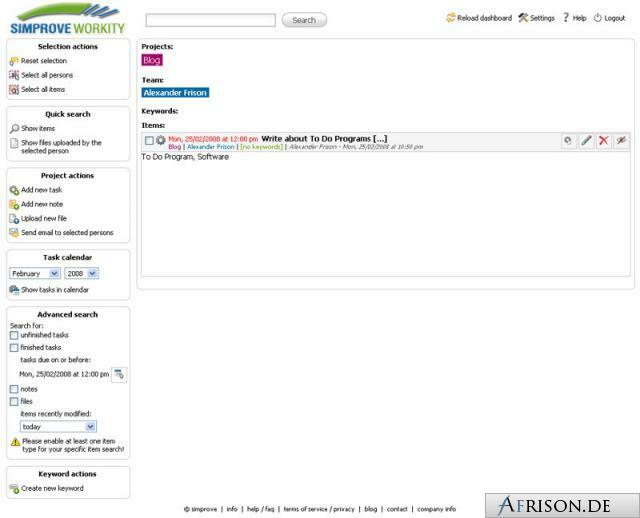 It contains a Wiki where you can put all information about a project, text, files, images and more. Time management and support tracking is also possible. ProjectOffice.net is still in Beta, which you will notice sometimes. But the development is very active. Still in Beta, no possibility to set priority. Task list is only showing tasks due today. No repeat functionality. I’m sure all little bugs will be ironed out shortly and the program will work perfectly. The only question is, how much will they charge in the future, currently it’s for free since it’s in beta. But you can ask them in person if you get a chance to go to the CeBIT in Germany. They will be there. 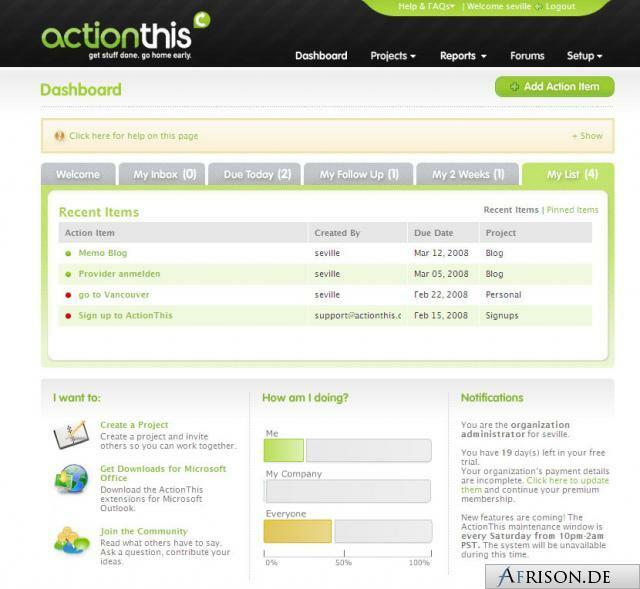 ActionThis is a little bit simpler. The front end looks very nice, but sometimes I got lost in the beginning. But after some minutes I was pretty familiar with the navigation. The tasks are devided by “Due Today”, “Follow Up”, “Due in 2 weeks” and “List All”. Very good alternative if you like to sort your tasks strictly by time. Nice user interface, report functionality. Also good for team work. You stay update with email notification of your current tasks. Assigning projects to another person is possible. Tasks, where their due date is later than 2 weeks are only showing in “List All”, it would be also good in “Due in 2 weeks (or later)”. It’s not possible to set priority for tasks. No recurring functionality. A perfect To Do Program for everybody who likes to sort his tasks by time. 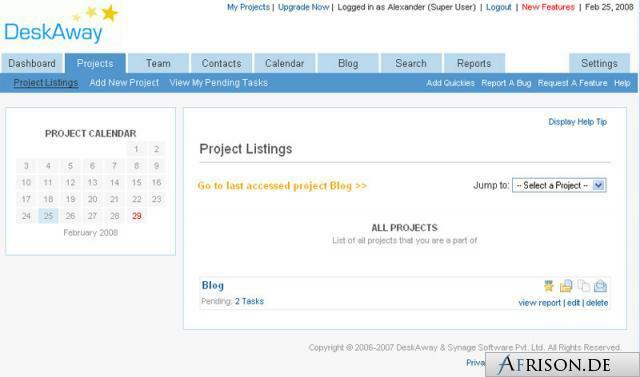 Easy creating of projects and tasks and assigning tasks to co-worker. It’s definitely worth a try. The free version is limited to 3 projects, but you can upload up to 25MB of files. Which is not possible in most programs for free. And again, this is another program with a lot functionality. With new, fresh ideas I didn’t see on any other program. Good for team work, easy to assign tasks to someone else. DeskAway includes a blog, nice calendar, internal and external contact list, report functionality, project status and much more. As you can read above loads of functionality. Additional you can set Milestones and assign tasks to a milestone, which have to be completed before reaching this milestone. You can also set priority, time of task and you can upload 25MB of files. No recurring function. In free version limited to 3 projects. But if you are clever, you can handle milestones as project and assign tasks to it. So there won’t be a limit. But if you think it’s worth it to use, you should just go ahead and upgrade. Besides that I can’t really see any other negative spots. After I checked it shortly the first time, it really surprised me when I checked it out further. The development team thought through every step. Almost no lack of good usability or any other flaws. For every pro user a must try out and I’m sure some user will stick with it. Simprove Workity is the second last program I introduce today. In comparison to most other programs, everything is on one page. Even though it contains a lot functionality. That brings the advantage, no user gets lost in sub pages, but it is also challenging to keep the navigation and page clean and organized. That might be the reason why in the beginning it’s hard to find out all functionality and where everything is. But after some minutes of trying out and watching the video, I think it’s worth to invest the time. Because of the one page navigation it’s hard to understand all functions and how they work in the beginning. It’s helpful to watch the video. Some icons are not self explained, or not that obvious I think. No priority function, which can easily replaced by the tagging system ïf you tag the task with “high priority” for example. No recurring function. At the beginning it wasn’t so easy to navigate through and get familiar with all functions. Just after I watched the video and further testing I got to know the program very well. I think the program has a lot potencial and the development team is working hard on enhancements, their blog is pretty active with news about the develoment. If you want to know more about workity, check out their website or visit them at the CeBIT in Germany. This is a simpler To Do list, with a very good navigation. 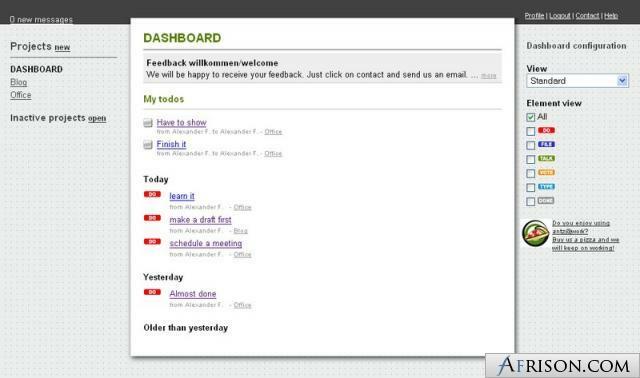 Ability to create sub tasks and assign files, links and more to a task. Very easy and clean navigation. Easy to create projects and tasks. Priority function. Not possible to set a date. I didn’t really understand why some tasks on the dashboard are under “today” and some are under “to do”. If I assigned it to a name it is under “to do” if it’s not assigned to anybody it is under “today” “yesterday” or “Older than yesterday”. The reason is, because it is team oriented. If you don’t assign it to yourself or someone else it will stay under Today or Yesterday until someone in the team is picking it up. I really like this program, it’s absolutely easy to use. But why are some tasks under “My todos” when they are not assigned to anybody? I didn’t figure it out yet. A little bit confusing but besides that a neat little program. If you didn’t read the first part of 16 Free Online To Do Programs In A Great Overview please check it out here. Thanks for sharing those tools! I’ll try t check some that I’m interested to. hope you will like some of them. Thanks very much for the great review. On Friday by noon we will have a new release which is full with new and improved functionalities. 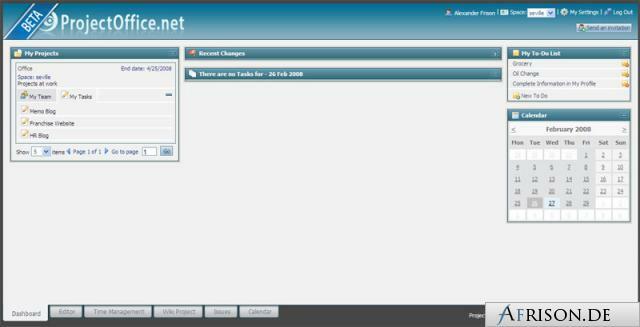 Additionally, the ProjectOffice.net Buzzer (desktop notifier for recent changes) and iGoogle, Netvibes and PageFlakes gadgets will be available as well. Appreciate the great review! Thank you. I’m looking forward to see the new features, it’s already really good. You should go check out Plancake, as well.